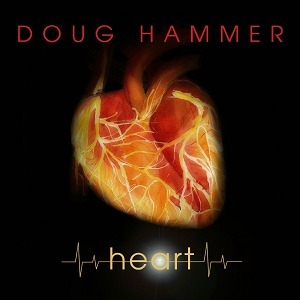 Doug Hammer's latest musical effort is called Heart and it is a wonderful name for a collection that touches your heart from the very first note to the last refrain. Some albums soar to the stars and pull you along for the ride while regaling you with the latest techniques in computer generated sound. Some albums want to pour everything but the kitchen sink onto the tracks to show you the impressive abilities of the artist whose music you are listening to. With Doug Hammer's release Heart the music is oftentimes as gentle as a whisper but it packs an emotional punch that belies the simplicity behind each of the compositions found on this album. I would say that the very fact the music can speak so directly to the heart shows the exceptional skill and the musicianship of Doug Hammer as both a performer and a composer. While the world's philosophy can often be summed up with more is better that is not always the case when it comes to music. Sometimes feelings and emotions can be woven into a musical composition with very simple melodies and with a pace that allows the listener to absorb what the music is speaking to them without trying to rush the listener along to reach the conclusion. With nothing more than his piano, a voice and a cello Doug has taken some very personal emotions and faithfully translated them into compositions that allow the listener to experience those emotions right along with Doug through the medium of his latest release. Doug's music captures both the wonder and the sadness of living in the complex world of the 21st century. His song Spinning Sky gives you the feeling of soaring through the sky twisting and turning as you see the colors of the earth below and the sky above blending into soft blur before your eyes. This song leaves you feeling joyful and looking skyward with a sense of adventure in your heart about what lies ahead in your own life this very day or a year from now. Well composed music is supposed to pull things out of the listener and allow them to open up to ideas and feelings that perhaps they had not considered before and this song in the number 2 position on this album does an admirable job of doing just that. But as everyone knows life is not always about those mountaintop experiences where everything just falls into place and happy endings are always awaiting the main character at the end of the story. We can pick up any newspaper or visit any online news source and we will very quickly be reminded that the world is often a very hurtful place filled with sadness and happy endings seem so elusive for so many. On one of the videos on Doug's YouTube site that offers his take on each of the songs in this collection he says that 6 out of the 18 songs on Heart were written about Newtown and the tragedy that occurred there. The songs on this album are tinged with the sadness of the loss of innocent life and if you are aware of this fact as the source of the inspiration for the songs that Doug wrote for this collection the songs tear at your heart and bring you face to face with the emotions that the country and the world felt upon hearing the débuting reports coming out of Newtown. The songs ache with the loss suffered that day even as they try to bring some kind of closure and some comfort for all of those hearts out there that are still broken and mourning. The album was called Heart for a very good reason. The album opens and ends with a song called Heart and I think that this is a very deliberate action on Doug's part as it shows that no matter how horrific the events we go through as human beings life does go on and our hearts continue to beat and feel through it all. They may be broken but someday perhaps they will heal and they will love again never forgetting what happened but able to move forward once again. I think this is what Doug has done with the last couple of songs on this album. Heartlight and The Chimes Are Ringing are towards the end of the album and they remind you through the positive feelings that they create in the listener that life does find a way to go on. These two songs fill the listener with hope. Hope is such a wonderful thing to be left with as the album winds down because that is what moves us forward as human beings. We all hope that tomorrow will be a better day and that some day no one will ever have to endure a day like those parents did in Newtown. The Chimes Are Ringing finds Doug pouring his soul into the composition as he dares to hope for a brighter future for his own boys and for children all around the world. Heart is an emotional journey that you will not regret taking with Doug as you listen to this album and allow his music to help heal the wounds as you remember the darkness of that day but allowing him to remind you that the sun will someday shine through the darkness to warm your heart once again. I would definitely recommend picking up a copy of this album for yourself and let Doug tell you what he feels through his music.